This project presents the effect of milk fat globule membrane (MFGM) proteins, specifically lactoferrin, on the immune response of Drosophila melanogaster when exposed to Serratia marcescens, an entomopathogenic bacterium known to infect the flies. Lactoferrin is thought to have antibacterial properties by binding iron and diminishing the supply required by bacteria. However, despite this suspected link, there is a lack of literature regarding the direct effect of these proteins on the immunology and gastrointestinal flora of organisms. In this experiment, lactoferrin protein was obtained through RNA extraction, Polymerase Chain Reaction (PCR), and bacterial transformation. The plasmid was subject to a double digest using restriction enzymes EcoRV and NotI, then ligated. 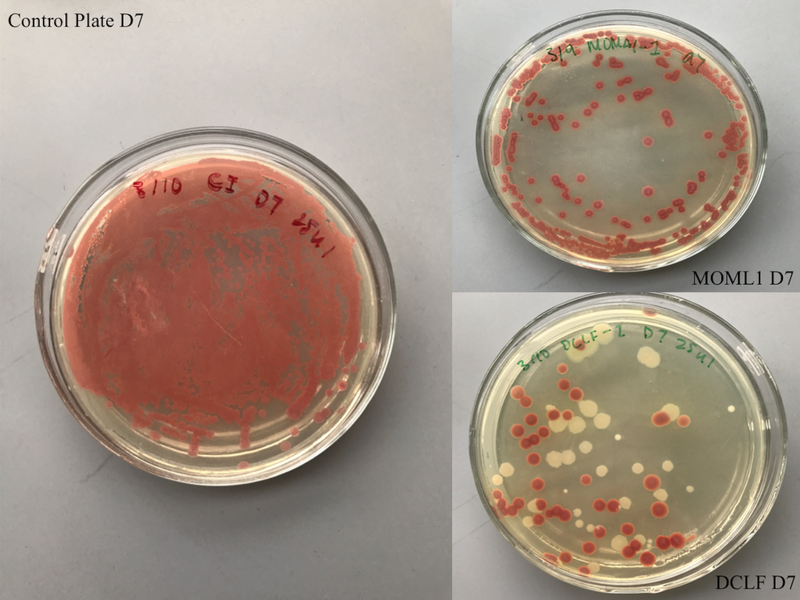 While successful bacterial transformation was achieved and verified through PCR on transformed colonies, pre-transformed Escherichia coli were ordered for Dharmacon GE Life Sciences. The lactoferrin produced by these cells was used because the cells arrived before bacterial transformation was successful. After protein purification, lactoferrin was fed to D. melanogaster, which were transferred to tubes containing MacConkey agar or agar inoculated with S. marcescens. The survival rate was recorded, and dead flies were crushed and plated to determine the magnitude of infection. When plates of the experimental groups (bred on milk) and control groups (never exposed to milk) were compared, the experimental groups had significantly less bacterial growth, establishing the MFGM proteins’ antibacterial properties. The death rates also suggested that MFGM proteins did have a positive effect on the immune response of D. melanogaster. All the collected data was shown to be statistically significant by conducting a Chi-square test and a two sample T-test. Thus, it can be concluded that lactoferrin increases the immunity of Drosophila to S. marcescens, and this data correlates to the benefits of drinking whole milk and breast milk. This correlation will be useful in creating anti-bacterial pharmaceutics or alternative milk products. Literature shows that the milk fat globule membrane (MFGM) proteins may have properties with anticancer, antiviral or antibacterial effects that are beneficial to organism immunology (Spitsberg, 2005). Lactoferrin is one such protein, and its ability to bind iron and diminish the supply required by bacteria is thought to be the mechanism behind its hypothesized antibacterial capabilities (WebMD, n.d.). However, research involving the quantitative effect of lactoferrin relating to model organisms is lacking. Drosophila melanogaster, commonly known as the fruit fly, is often experimented with because of its short generation time, simple genetics, and non-adaptive immune system (American University of Beirut, n.d.; FlyBase, 2016; Geiger P, 2015; JoVE, 2006; Spitsberg V.L., 2005). In this experiment, it was also used because 75% of its disease pathways are conserved between fruit flies and humans, which makes D. melanogaster an ideal model organism to study the effect of the MFGM proteins on human immunology (Pandey U.B. and Nichols C.D., 2011). Serratia marcescens is an entomopathogenic bacteria known to infect the fruit fly and, depending on the method of infection, typically kills them within a week (Broderick N.A. et al., 2009; Mohamed F and Jones C, n.d.). This project presents the effect of MFGM proteins (Cavaletto et al., 2008; Hintze et al., 2011; Liao et al., 2011), specifically lactoferrin, on the immune responsivity of D. melanogaster when exposed to S. marcescens (Figure 1). Lactoferrin is thought to have antibacterial properties by binding iron and diminishing the supply required by bacteria. However, despite this suspected link, there is a lack of literature regarding the direct effect of these proteins on the immunology and gastrointestinal flora of organisms. In this experiment, lactoferrin protein was obtained through RNA extraction, polymerase chain reaction (PCR) and bacterial transformation. The plasmid was subject to a double digest using restriction enzymes EcoRV and NotI, then ligated. 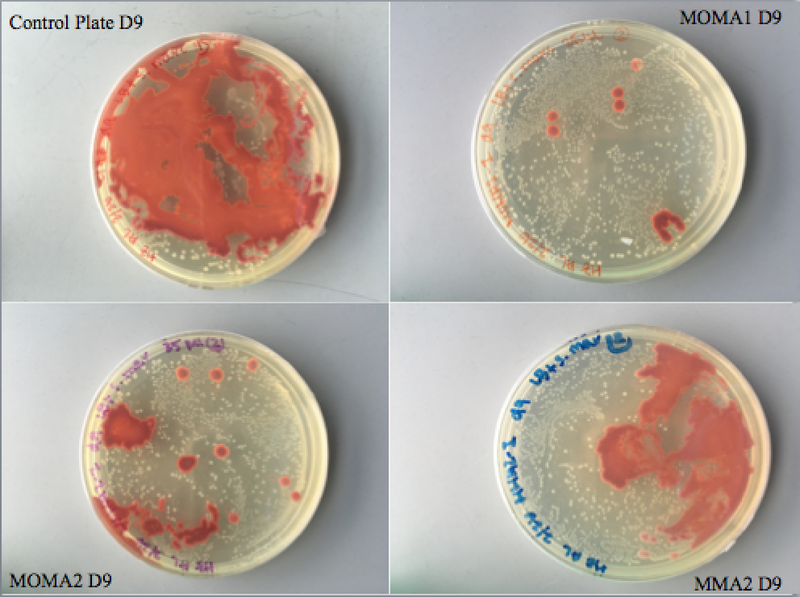 While successful bacterial transformation was achieved and verified through PCR on transformed colonies, pre-transformed Escherichia coli were ordered from Dharmacon GE Life Sciences. The lactoferrin produced by these cells was used because the cells arrived before bacterial transformation was successful. After protein purification, lactoferrin was fed to D. melanogaster, which were transferred to tubes containing MacConkey agar or agar inoculated with S. marcescens. The survival rate was recorded, and dead flies were crushed and plated to determine the magnitude of infection. When plates of the experimental groups (bred on milk) and control groups (never exposed to milk) were compared, the experimental groups had significantly less bacterial growth, establishing the MFGM proteins’ antibacterial properties. The death rates also suggested that MFGM proteins did have a positive effect on the immune response of D. melanogaster. All the collected data was shown to be statistically significant by conducting a Chi-square test and a two sample t-test. Thus, it can be concluded that lactoferrin increases the immunity of D. melanogaster to S. marcescens, and this data correlates to the benefits of drinking whole milk and breast milk. This correlation will be useful in creating antibacterial pharmaceutics or alternative milk products. This project had two general parts. The first part was to obtain lactoferrin, a MFGM protein. The second was to feed it to fruit fly experimental groups and observe how the immunological response of these groups differed from the flies that were not fed any MFGM proteins. The immunological response of the fruit flies was stimulated by exposing them to a lethal bacterial stress, S. marcescens, and quantified in two ways: by recording the survival rate after bacterial exposure, then by examining the extent of internal bacterial infection. To acquire the lactoferrin protein, the lactoferrin gene was obtained through bovine RNA extraction, reverse transcribed into DNA, then amplified through PCR. Because initial PCR attempts were unsuccessful, pre-transformed E. coli were ordered from Dharmacon GE Life Sciences. While successful PCR was ultimately achieved, the lactoferrin produced by these cells was used because the cells arrived before PCR yielded results. Various methods, primarily enrichment columns, were used to purify the protein from the media (Kendrick Labs, n.d.; Physics Forums, 2008; Herskovits T.T. et al., 1970; Wagner J, n.d.). The presence of the lactoferrin protein was verified using SDS-PAGE. Next was the second portion of the experiment: D. melanogaster orally ingested the protein elution. 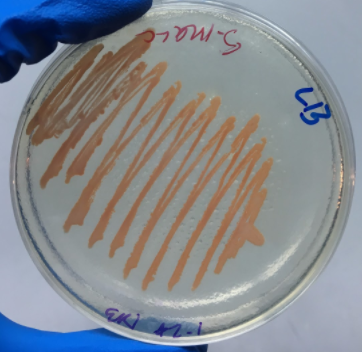 Seven days later, the adults were transferred to tubes containing only MacConkey agar, the medium upon which S. marcescens grows, some of which were inoculated with S. marcescens. Data was collected by recording the number of surviving flies daily. The magnitude of gastrointestinal bacterial infection was then determined by bursting open the body cavity of dead flies and plating dilutions of this mixture on LB agar. Colony-forming units (CFUs) or percent coverage of the plates was recorded. This process was repeated with flies bred on whole milk and larvae laid by the milk and lactoferrin adult flies. Chi-square and two sample t-tests were used to verify the statistical significance of the data and p-values were obtained. For specific protocols and detailed reasoning behind each step, see below. The Takara kit and its accompanying protocol were used. RNA extraction was challenging, because RNA is very easily degradable by the RNAases found in the environment, so this procedure required sterile technique and the use of surgical masks. RNA extraction was the first step to obtain the lactoferrin gene, because a copy of the complete genome was required before PCR could be used to amplify the specific target gene. The Takara kit and its accompanying protocol was used. This procedure was a transitional step used to transcribe RNA into DNA so PCR could amplify the lactoferrin DNA gene. After this step, gel electrophoresis was conducted to verify the successful extraction and reverse transcription of the bovine genome. The Promega GoTaq Green Master Mix and 25 µL reaction protocol was used. Primers were designed on NCBI BLAST and bought from Sangon Biotech. Initially, PCR was unsuccessful because of difficulties with the thermocycler and primer annealing. 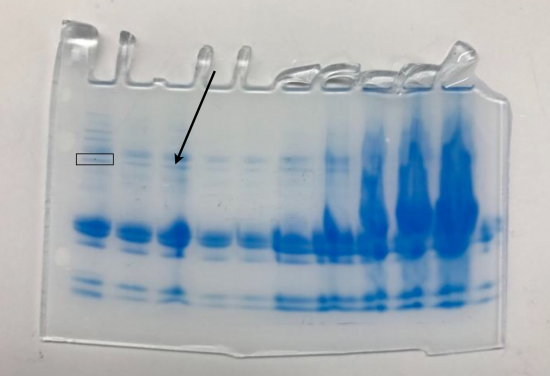 PCR was only successful (and confirmed with gel electrophoresis) after pre-transformed E. coli with the lactoferrin gene were ordered from Dharmacon GE Life Sciences. The purpose of PCR is to acquire the lactoferrin gene so it could be inserted into a plasmid and the lactoferrin protein could be produced by transformed bacteria cells. While the transformed cells created by the researchers were not used, it was attempted. First, a plasmid was digested with EcoRV and Not1 from ThermoFisher Scientific. This was verified using gel electrophoresis. There were two bands shown—the heavier DNA band, which was the plasmid, was the band of interest. This band was cut from the gel and cleaned up using a Takara kit. A specifically cut plasmid was needed for the lactoferrin gene insert to ligate with it correctly. Then a Takara ligation reaction was performed, sealing the plasmid, and this was used to transform DH5a high efficiency cells. Bacterial transformation was conducted, and the transformed cells were plated onto LB/amp/IPTG/X-gal plates. There were white bacterial colonies (which are the transformed cells, as opposed to the blue untransformed cells), but there were no successful PCR verifications of transformation conducted. Because this step was delayed because of the unsuccessful PCR, the pre-transformed cells from GE Life Sciences were used. Protein purification was conducted for both whole milk and the LB media containing the transformed cells with the lactoferrin gene—which also contained lactoferrin produced by the cells. The whole milk, which should also contain lactoferrin, was centrifuged in an enrichment column with a filter of 100 kDa, which allowed the 80 kDa lactoferrin protein to flow through it. This flow-through was used, and the cream trapped above the filter was discarded. Ethanol was added to a sample of the lysogeny broth (LB) media to kill bacteria within, which did not harm the lactoferrin protein. This solution was then also spun in the enrichment columns in the same way as the whole milk. The purpose of this step was to make the solution, later fed to the fruit flies. By purifying the solutions, they contained fewer proteins so lactoferrin was the main protein conserved between whole milk and LB media samples. This way, the effects on fruit fly immunology were most likely to be because of the lactoferrin, not another protein. To ensure that the purified protein mixtures contained lactoferrin, sodium dodecyl sulfate polyacrylamide gel electrophoresis (SDS-PAGE) was performed. There was a protein the same size as lactoferrin in the samples (Figure 2). The band in the protein ladder that is has been boxed is of a similar size to lactoferrin, and the band indicated by the arrow (and all other bands of the same size) is the size of lactoferrin (~80 kDa). Figure 2. Right to left: protein ladder (well 1), purified LB media of transformed cells (wells 2-5), purified whole milk sample 2 (wells 6-7), purified whole milk sample 1 (wells 8-10). Some flies were removed from their stock tubes and bred in tubes with the whole milk solution or the lactoferrin LB solution pipetted on the surface of their media. Other flies were transferred to tubes with milk-made media (media powder mixed with milk rather than water). They were bred on this milk media for seven days. There were two types of whole milk, type 1 and type 2. Adults bred on media were mature D. melanogaster that were directly transferred into tubes containing various milk medias. These adults laid larvae in these tubes. The mature adults were later transferred out and the larvae were raised on a type of milk media until maturity. MacConkey agar tubes were prepared by pouring liquid agar into fly tubes. Then, LB broth containing S. marcescens was pipetted on top of some of these tubes. Others had LB broth without any bacteria pipetted on top to be used as controls. There were three tubes of 10 flies and three tubes of 15 flies for each group of flies. Flies were transferred into these MacConkey tubes, and then the tubes were lain horizontally on a sterile lab bench to ensure that the flies were not dying because they were getting stuck in the bacterial lawn at the bottom of the tube (Figure 3). Figure 3. 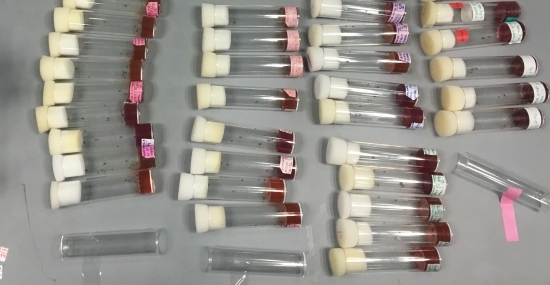 MacConkey agar tubes containing experimental (pink labels) and control groups (white labels) of fruit flies. Fruit flies of the same age range as the experimental groups were grown on regular media, never being exposed to MFGM proteins. These flies were then transferred to MacConkey agar tubes, some of which were inoculated with S. marcescens (as described above). 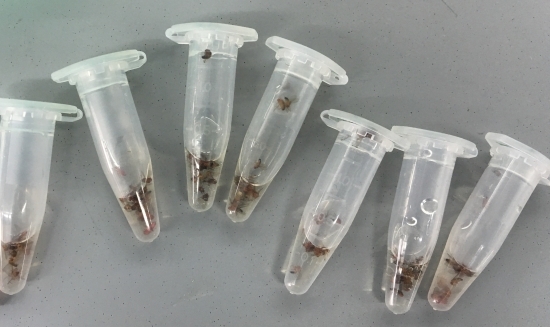 The flies in uninoculated tubes (the MacConkey tubes with LB media without bacteria) served as an overall control, to demonstrate that the flies were dying not because of starvation, but due to S. marcescens infection. The flies in inoculated tubes served as a control to compare with the milk-bred flies to. Every twenty-four hours, the number of flies still alive in each tube was recorded. After all the flies in a tube of fifteen flies had died, thirteen of the flies were picked out with a sterile loop and rinsed in ethanol. This way, the bacteria on the exterior of their body cavity was eradicated. Then, they were rinsed in distilled water to remove any ethanol residue. The flies were then placed in a 1.5 mL Eppendorf tube with LB broth (Figure 4) and crushed with a micropestle. This solution was then serially diluted in a 1:9 ratio with more LB broth. Dilutions 7 and 9 are shown in the results below. These dilutions were then plated on LB agar, incubated for twelve hours at 26°C, then incubated at room temperature for forty-eight hours. S. marcescens, the bacteria of interest, grows bright red at this temperature, and only the percent coverage of bright red bacterial growth was calculated. This percent coverage calculation quantified the extent of internal bacterial infection of the various fly groups. 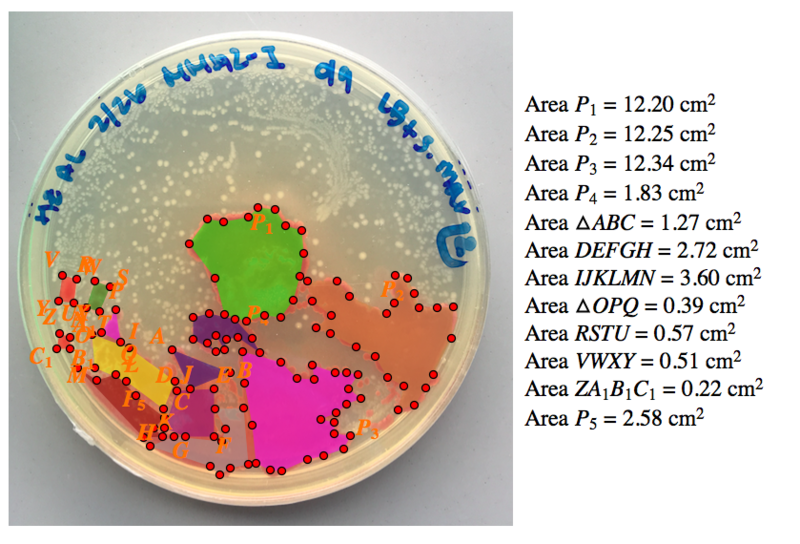 Two ways were used to quantify the impact of whole milk on the health of D. melanogaster when exposed to S. marcescens: the survival rate data of D. melanogaster and the colony forming units/percentage coverage of S. marcescens from plated experimental groups. Table 1 shows the survival data, and the groups are separated into treatment groups as well as the number of flies in the tube (10 flies tube #1, 15 flies tube #2, etc.). As stated in the methodology, we had 3 tubes of 10 flies each and 3 tubes of 15 flies each for more reliable data. Table 1 also contains some cells stating N/A, meaning not available due to the limited number of experimental group flies. Chi-squared tests were conducted using the matrix function on a graphing calculator. 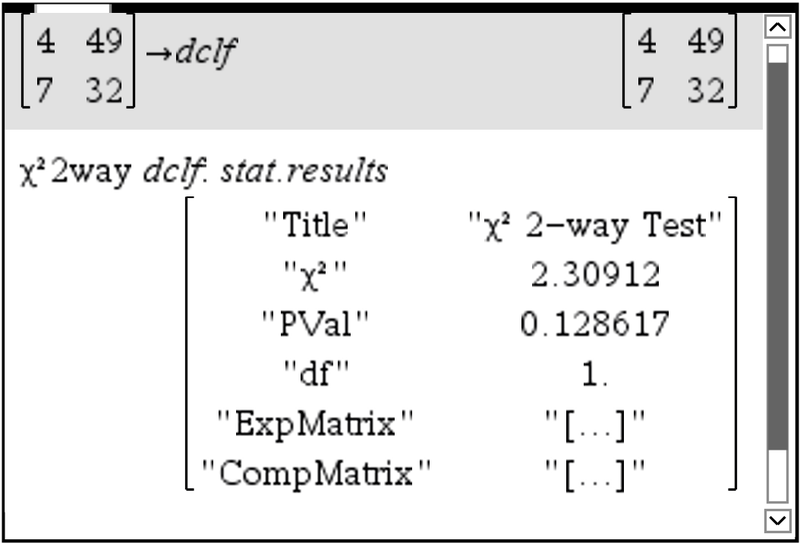 Figure 5 depicts the chi-squared tests on the survival rate data shown in Table 1. The chi-squared tests compared the expected and observed numbers of live and dead flies on the second day after transfer. The observed numbers were taken from the control groups, and the corresponding ratio was calculated for the expected number in experimental groups. Table 2 shows the calculated probability values from this test for all experimental groups. The chi-squared tests calculated probability values, which are subsequently shown in Table 2 for all experimental groups. Probability values show the decimal probability that the difference in data points for observed and expected values are due to random chance. For example, a probability value of 0.000011 (as shown in MOMA1) corresponds to a 0.0011% probability that the results were completely due to chance alone. This indicates that there is an over 99% probability that some other factor (in this case, the MFGM proteins found in whole milk) was affecting the data and causing the increased survival rate. Figure 5. Chi-squared test for fly survival rate. Table 2. Probability values generated during chi-squared test. 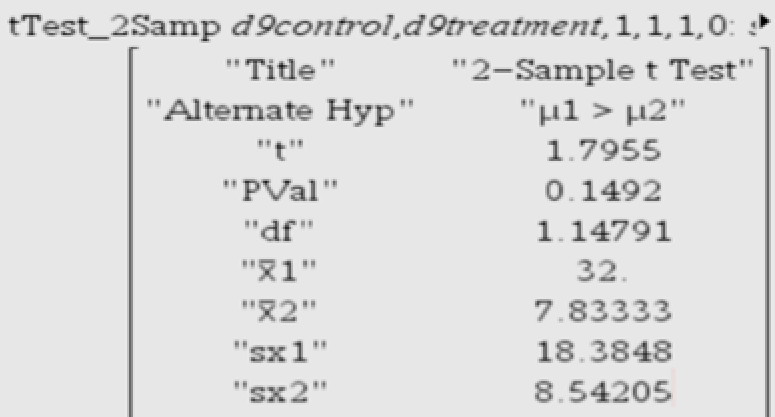 Figures 6 show serial dilutions 7 and 9 for various treatment groups. The serial dilutions were plated on LB and incubated overnight at 26°C. Figure 6. Plates prepared from serial dilutions 7 (A) and 9 (B). MOMA1: adults bred on milk (type 1) on media; MOMA2: adults bred on milk (type 1) on media; MMA2: adults bred on milk (type 2) made media; MOML1: adults that have been bred on milk (type 1) on media since larval stage; DCLF: adults bred on the lactoferrin solution on media; D7: serial dilution 7; D9: serial dilution 9. The percent coverage of S. marcescens on control plates was compared to that on experimental plates. The percent coverage was quantified using Geometer’s Sketchpad (Figure 7) by overlaying polygons on the regions of S. marcescens and finding the areas of these polygons. The calculated values for all the experimental groups were then graphed (Figure 8). A two-sample t-test was conducted for each set of dilutions to test for significance (Figure 9). Similar to a chi-squared test, a two-sample t-test produces probability values but instead uses the entire data set as a whole for each dilution. 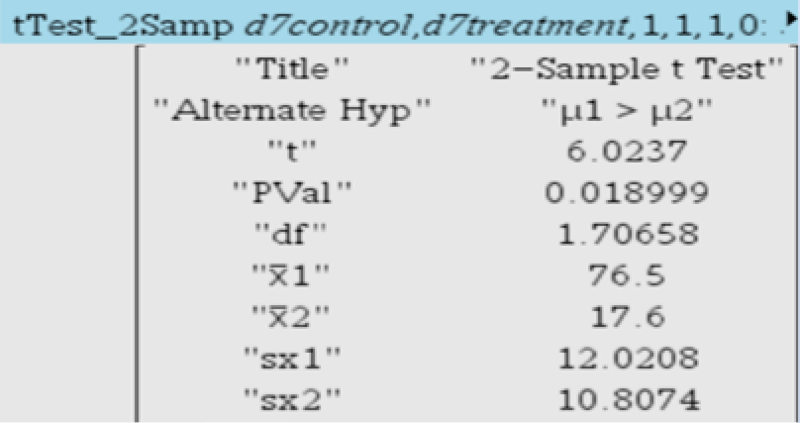 Thus, Figure 9A shows the probability value of all the dilution 7 data values compared to the dilution 7 control value, and Figure 9B shows the probability value of all the dilution 9 data values compared to the dilution 9 control value. Figure 7. Quantification of percent coverage using Geometer’s Sketchpad. Figure 8. 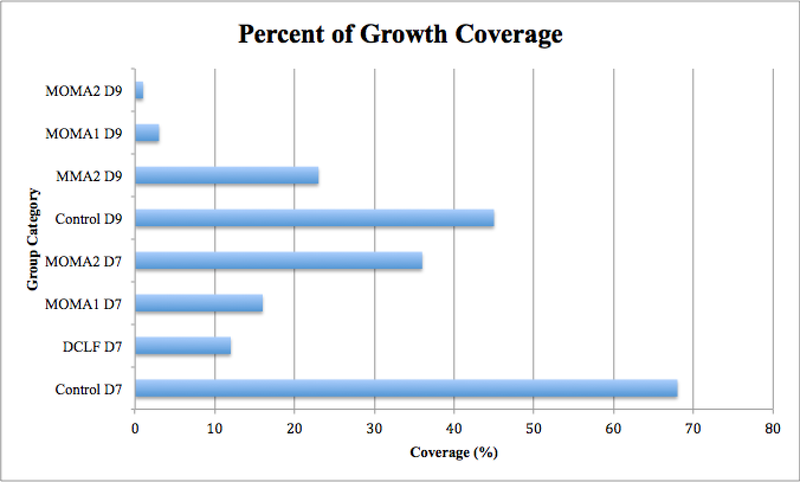 Percent of growth coverage for all groups. Figure 9. Probability values of dilution 7 (A) and 9 (B) values. No groups that were in tubes without S. marcescens had bacterial growth when plated, indicating that the reasons behind fly death were unrelated to bacterial infection. Therefore, the survival rates of these groups serve as a viable control comparison to those of the inoculated groups. Based on the extremely low probability values for percent coverage and survival rate, MFGM proteins as a whole and lactoferrin in particular are beneficial for the immune response of D. melanogaster when exposed to S. marcescens. One likely mechanism behind lactoferrin’s demonstrated antibacterial properties is its function as a transcription factor. One gene it stimulates is IL-1beta. Signals from the IL-1 receptor can activate an immune response in a D. melanogaster hemocyte cell line (Curran CS et al., 2006; Kleino A and Silverman N, 2014; Myllymäki H et al., 2014). Some studies also suggest that it increases transcription of CecA1, a gene coding for a bactericidal peptide (Rosetto M et al., 1995). D. melanogaster is a prime model organism to study human immune system responses since nearly 75% of human disease-causing genes are believed to have a functional homolog in the fly (Pandey UB and Nichols CD., 2011). In addition, many basic physiological and biological properties are conserved between the two organisms, and D. melanogaster offers the benefits of low-cost, parallel genetics and highly conserved disease pathways. This experiment offers data that validates the increased levels of lactoferrin in infant formula and the claims that whole milk has benefits that skim or low-fat milk do not (Spitsberg, 2005). Furthermore, it supports the use of lactoferrin as a treatment for Propionibacterium acnes, a bacteria that causes skin inflammatory lesions (Kim J et al., 2010). Pharmaceuticals can be designed that would utilize the natural properties of lactoferrin as vitamins or as preemptive measure against common but not especially virulent bacterial infections, such as Staphylococcus aureus, Streptococcal pharyngitis and Salmonella enterica. Additionally, lactoferrin could be an alternative to pesticides in agriculture to prevent the proliferation of pesticide-resistant bacteria. The next step of this research experiment would be to investigate the effect on other stresses such as the aforementioned bacteria, viral infections or adverse environmental conditions like pH and temperature. Additional research regarding the effect of other MFGM proteins, such as xanthine oxidase, lactadherin and mucin 1, could also be conducted. Furthermore, the study could be expanded to include organisms like mice and other mammalian model organisms to better predict effects on the gastrointestinal flora of humans. The authors would like to thank their faculty mentors Mr. Daniel Barrientes and Mr. Todd Gordon for contributing invaluable advice and insights to help refine the experiment. We greatly appreciate their guidance and experience. Without their encouragement and input, this study would not have been possible. Ms. Kathleen Mahoney’s statistical expertise was also extremely helpful. She helped us quantify our data and interpret conclusions from the experiment. Additionally, we appreciate the work of the lab technician Ms. Ivy Xu, who helped us access the necessary materials for our experiment. The support and guidance of Dr. Yujie Fan’s Chinese Academy of Science, Institute of Plant Physiology and Ecology SIBS, CAS at Fudan University is also greatly appreciated. American University of Beirut. Drosophila melanogaster [Internet]. [cited 2016 Sep 21]. Available from http://bit.ly/2uCcmq5. Broderick NA, Welchman DP, Lemaitre B. Recognition and response to microbial infection in Drosophila [eBook]. New York: Oxford University Press; 2009 [cited 2016 Oct 7]. Available from: http://bit.ly/2vBzpyO. Cavaletto M, Giuffrida MC, Conti A. Milk fat globule membrane components–a proteomic approach [Abstract]. Advances in Experimental Medicine and Biology. 2008 [cited 2016 Sep 23];606:129-141. Available from http://bit.ly/2w3tZzG. Curran CS, Demick KP, Mansfield JM. Lactoferrin activates macrophages via TLR4-dependent and -independent signaling pathways [Abstract]. Cell Immunol. 2006 [cited 2017 Mar 13]; 242(1):23-30. Available from: http://bit.ly/2w35K4z. FlyBase: A database of Drosophila genes & genomes [Internet]. c2016 February [cited 2016 Sep 27]. Available from http://flybase.org/. Geiger P. An Introduction to Drosophila melanogaster [Internet]. 2015 Apr 27 [cited 2016 Sep 13]. Available from: http://bit.ly/2vBs6Hn. Herskovits TT, Gadegbeku B, Jaillet H. On the structural stability and solvent denaturation of proteins [Abstract]. J Biol Chem. 1970;245(10):2588-2598. Available from http://bit.ly/2w3JrM1. Hintze KJ, Snow D, Burtenshaw I, Ward RE. Nutraceutical Properties of Milk Fat Globular Membrane. In: Elnashar M, editor. Biotechnology of Biopolymers. Intech; 2011. Available from: http://bit.ly/2uGB4BV. JoVE Science Education Database. An Introduction to Drosophila melanogaster [Internet]. c2006 [cited Sep 12]. Available from: http://bit.ly/2uGLots. Kendrick Labs. Ethanol precipitation of Protein: Protocol and % Recovery [Internet]. [cited 2017 January 14]. Available from http://bit.ly/2wIzdOh. Kim J, Ko Y, Park Y, Kim N, Ha W, Cho Y. Dietary effect of lactoferrin-enriched fermented milk on skin surface lipid and clinical improvement of acne vulgaris. Nutrition. 2010 [cited 2017 Mar 11];26(9):902-909. Available from: http://bit.ly/2wWJSUW. Kleino A, Silverman N. The Drosophila IMD pathway in the activation of the humoral immune response. Dev Comp Immunol. 2014 Jan [cited 2017 Mar 13];42(1). Available from: http://bit.ly/2i0jZB8. Liao Y, Alvarado R, Phinney B, Lönnerdal B. Proteomic characterization of human milk fat globule membrane proteins during a 12 month lactation period [Abstract]. J Proteome Res. 2011 Jun [cited 2016 Sep 16];10(8):3530-3541. Available from: http://bit.ly/2uUYaE3. Mohamed F, Jones C. An investigation on fruit fly mortality and the carrier state in disease transmission with the bacterium Serratia marcescens [Internet]. [cited 2016 Sep 22]. Available from http://bit.ly/2wJgNNA. Myllymäki H, Valanne S, Rämet M. The Drosophila Imd Signaling Pathway [Abstract]. J Immunol. 2015 Apr 15 [cited 2017 Mar 12];192(8):3455-3462. Available from: http://bit.ly/2hXocFs. Physics Forums. Extraction of ethanol [Internet]. 2008 Jan 4 [cited 2017 Jan 15]. Available from: http://bit.ly/2vx7hOG. Rosetto M, Engstrom Y, Baldari C, Telford J, Hultmark D. Signals from the IL-1 receptor homolog, Toll, can activate an immune response in a Drosophila hemocyte cell line [Abstract]. Biochem Biophys Res Commun. 1995 Apr 6 [cited 2017 Mar 13];209(1):111-116. Available from: http://bit.ly/2w3rehG. Spitsberg V. Invited review: Bovine milk fat globule membrane as a potential nutraceutical. J Dairy Sci. 2005 July [cited 2016 Oct 5];88(7):2289-2294. Available from: http://bit.ly/2vUEzIA. Wagner J. Studying Proteins and Protein Purification [Internet]. [cited 2017 Jan 16]. Available from: http://bit.ly/2wXvH22. Ward PP, Uribe-Luna S, Conneely OM. Lactoferrin and host defense [Abstract]. Biochem Cell Biol. 2002 [cited 2017 Mar 9];80(1):95-102. Available from: http://bit.ly/2i0mO5c. WebMD. Lactoferrin: Uses, side effects, interactions and warnings [Internet]. [cited 2016 Sep 28]. Availabe from: http://wb.md/2w6bppS.